I'm sure Ollie knows about this as well as half the geography department back at MGS, but I think Geograph.co.uk is the coolest website ever. 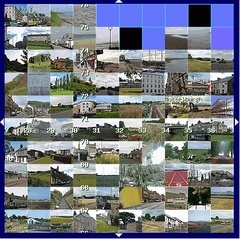 It is a project aiming to bring together geographically-related pictures of the entire British Isles and Ireland. Steve Beard tipped me off two minutes ago while cooking up a chicken and leek pie for supper - you don't get that in a Travelodge or Formule 1. Cool links or chicken and leek pie. He's lucky to live in the middle of some fields that have not yet been photographed. He worked out what photos are needed by superimposing the geograph map with the official map of the Ordinance Survey, using the outline of small roads to find out from which field his photos should be taken. Genius. I wonder if my pics from this morning would fit the bill. Scotland's not doing too badly but there's room for more photos in Dunoon and Cowal. There's a mission for you, mum and dad. OK, Ewan - I never could resist a challenge! You need to upload those photos we took the other morning on the way to Thomas Adams in Wem so I can tick them off.